Lock in a great price for Kimpton Hotel Van Zandt – rated 9.1 by recent guests! Great hotel! Worth every penny! Awesome location and the free bike rental was so valuable. Bars and great food is walking distance. Staff is very friendly and helpful. They sent up margaritas and chips and salsa because I mentioned at check in that we were here for my birthday. Great location. Great vibe. Many fun places nearby. Walkable! the decor and enviroment. the happy hour and morning coffee service. the service employees and the valet group were exceptional. Loved the location! Near bars and restaurants. Also right in downtown so that is available to you. Right off the highway so very easy to get in and out. Hotel has hip, cool vibe right next to Rainey Street. Very nice lobby area to relax. Geraldine's had good breakfast, lunch and dinner. Nice to also sit at bar for drinks and light fare. We also enjoyed drinks and lunch in pool area. Fire was going in evening. Concierge very friendly and gave good food recommendations but wasn't too knowledgeable on high end shopping areas. We were on 16th floor in corner room which was quiet with lovely view of city and river. The bed was also very comfortable! Hotel also kindly gave us late check out at no extra charge. 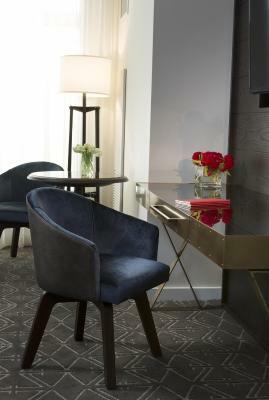 Kimpton Hotel Van Zandt This rating is a reflection of how the property compares to the industry standard when it comes to price, facilities and services available. It's based on a self-evaluation by the property. Use this rating to help choose your stay! One of our top picks in Austin.Offering an onsite bar and restaurant, Kimpton Hotel Van Zandt is located in the Rainey Street Historic District, less than 0.6 mi away from nightlife on 6th Street. This Austin hotel offers a rooftop pool with pool bar and complimentary WiFi access for "Kimpton Karma Rewards" members. A flat-screen cable TV and mini-bar are featured in every room at this Austin hotel. A work desk and safety deposit box are also available. Bathrobes and free toiletries are offered in the private bathroom. 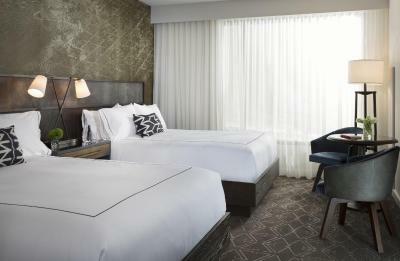 Kimpton Hotel Van Zandt offers room service, a fitness center and in-room massage and body treatments. Valet parking and free bicycle rentals are also available. Geraldine's, the Van Zandt's onsite restaurant, serves modern american fare made from local ingredients. Enjoy live music and views of the downtown skyline while sipping a craft cocktail from the award-winning drink menu. 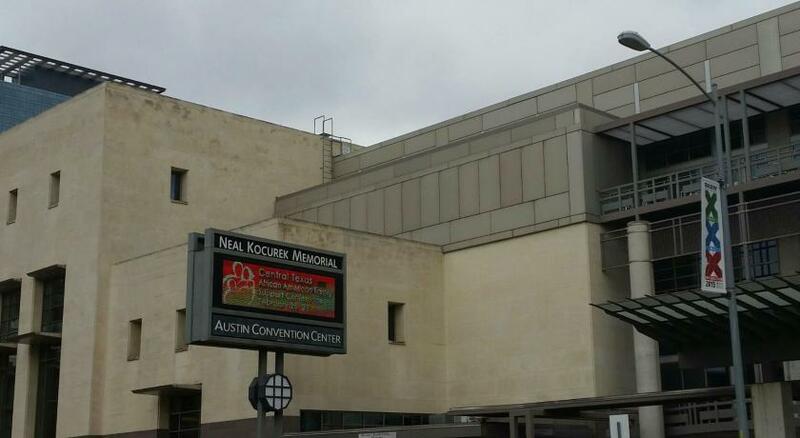 The hotel is 650 feet from Austin Convention Center, 0.9 mi from Capitol Building and 1.2 mi from Frank Erwin Center - University of Texas. Austin-Bergstrom International Airport is 5.6 mi away. This property is also rated for the best value in Austin! Guests are getting more for their money when compared to other properties in this city. 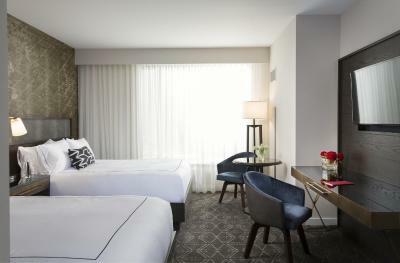 When would you like to stay at Kimpton Hotel Van Zandt? This air-conditioned room offers a flat-screen cable TV and a mini-bar. A work desk, yoga mat and in-room safe are also included. The private bathroom features upgraded bath products. Private parking is available on site (reservation is not needed) and costs USD 49 per day. Featuring an over-sized soaking tub, this air-conditioned room offers a flat-screen cable TV and a mini-bar. A work desk, yoga mat and in-room safe are also included. The private bathroom features upgraded bath products. 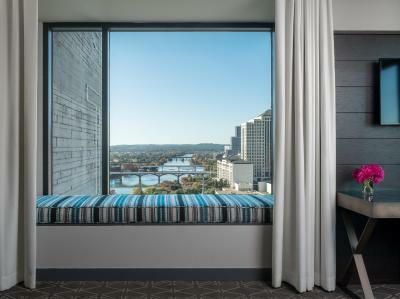 Featuring views of Lady Bird Lake, this air-conditioned room offers a flat-screen cable TV and a mini-bar. A work desk, yoga mat and in-room safe are also included. The private bathroom features upgraded bath products. 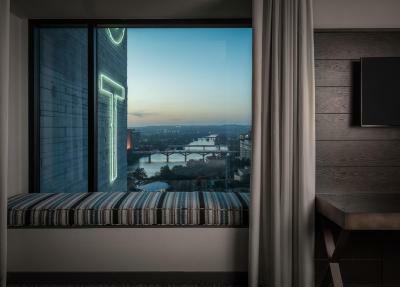 Featuring views of Lady Bird Lake, this air-conditioned room offers a flat-screen cable TV and a mini-bar. A work desk, yoga mat and in-room safe are also included. 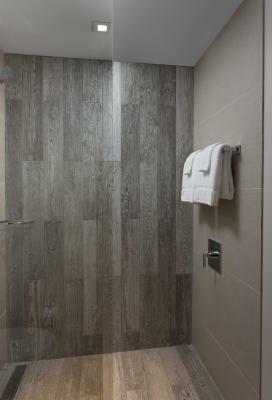 The private bathroom features a deep-soaking tub and upgraded bath products. Featuring an over-sized soaking tub, this air-conditioned studio offers a seating area with a flat-screen cable TV and mini-bar. A work desk, yoga mat and in-room safe are also included. The private bathroom features upgraded bath products. This air-conditioned suite offers a separate living room with a flat-screen cable TV and a mini-bar. A work desk, yoga mat and in-room safe are also included. The over-sized bathroom features a soaking tub and upgraded bath products. This air-conditioned room offers a flat-screen cable TV and a mini-bar. A work desk and in-room safe are also included. The private bathroom features upgraded bath products. This air-conditioned suite offers a separate living room with a flat-screen cable TV and a mini-bar. A work desk and in-room safe are also included. The over-sized bathroom features a soaking tub and upgraded bath products. WiFi is available in all areas and costs USD 15.99 per 24 hours. House Rules Kimpton Hotel Van Zandt takes special requests – add in the next step! Kimpton Hotel Van Zandt accepts these cards and reserves the right to temporarily hold an amount prior to arrival. Kimpton Hotels considers 10 or more rooms a group. Kimpton Hotels reserves the right to cancel 10 or more rooms booked online. Please contact the hotel directly if you are booking 10 or more rooms. Parking is available by the hour and for special events. Prices vary. The onsite restaurant, Geraldine's, offers complimentary parking to dining guests from Sunday through Thursday with validation. This accommodations prohibits open carry, concealed, possession, storage and transportation of firearms. By booking a reservation at this hotel, you acknowledge agree to the hotel's policy regarding firearms. For more information regarding this policy, please contact the hotel directly. The only thing is since the hotel is right next to Rainey street bars the music can be loud till late in the night especially if there is live music. They charged over $12 for WiFi. Staff and location was great. Wonderful hotel, nice deco and ambience. The hotel is decorated in a jazzy style and they also offer a 5pm happy hour drinks and snack. 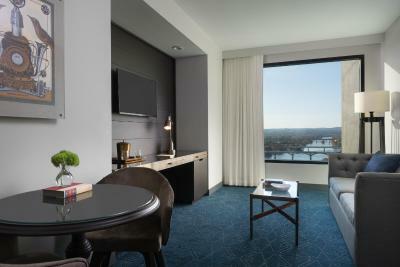 We have a nice corner room with a great view of the river. When we came back after our first day outing, we found a nice cheese plate and a bottle of red wine in our room. Very nice surprise. the parking situation. you're limited to the valet service which effictively adds to the room rate. ice machine location was somewhat an incovenience. the tv guide didnt match the actual channels. Eggs were extra fluffy and the bed was like a cloud. Construction going on so my lake view was somewhat ruined by demolition near hotel.